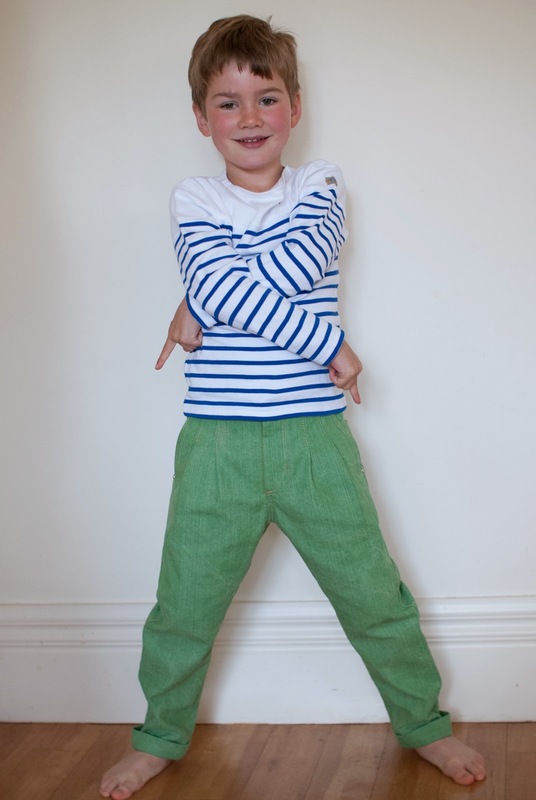 Since it's been school holidays and P has been conscientiously NOT wearing navy pants, it became apparent he had almost no other pants that still fit. I'd liked the baggy up top jodhphur-esque fit of the Banyan's, although I'm not as convinced that denim is the right fabric. The pattern is begging to be sewn in linen I think. I used a bronze-y coloured shiny thread leftover from this dress and a more subtle mushroomy grey thread which you can just see on the pockets and as a little detail around the fly and between the pleats on one side. I used two strands of thread to get enough visibility and I think it's a nice balance of subtle colours with a bit of detailing to make 'em look pro. 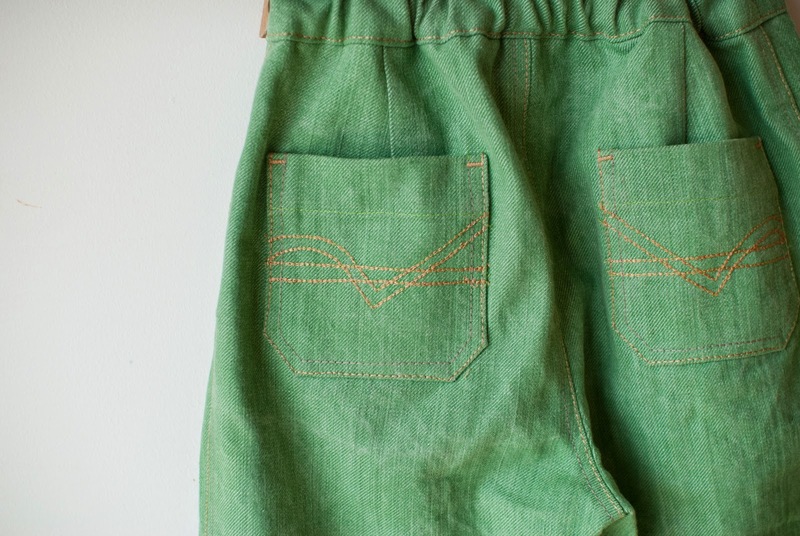 For more oomph on the back pockets I used that stitch on the sewing machine that goes forwards and backwards over the same stitch a few times. I love playing around with back pockets. It seems that as long as they're symmetrical then any pattern can look good. I need to start a little gallery for myself (should probably use that Pinterest thingy) to remember pocket patterns that I've seen that I want to copy. Just need to work out how to subtly photograph people's butts. 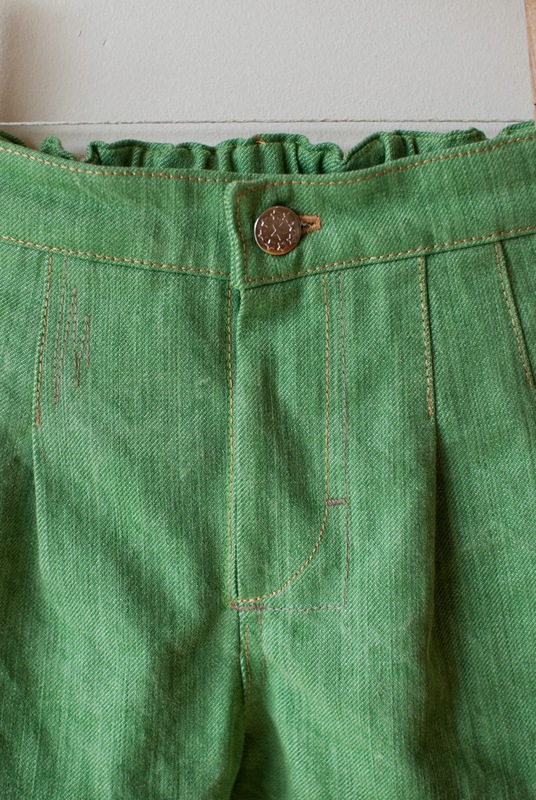 For these non school issue pants I used the little clothing label that came with the pattern (love that). And how cute is the top that my mother in law brought back from a recent Mediterranean cruise?! My kids wardrobes are now almost entirely sewn by me with the exception of the T-shirts from around the world. On any given day the kids could be wearing a T-shirt from Madagascar or Syria or Canada... I really wish I'd started a checklist of countries at the beginning! I'm pleased to say that second time around the zip fly was a breeze. I think I came to zipper sewing from the wrong end. The first zipper I ever installed was an invisible zip and so I thought it was all about sewing as close as possible to the zipper teeth. Turns out with fly zips a more casual and less uptight approach works best. Just the way these laid back pants like to rock too. Back to school next week and I'll miss the colour this kid brings to my day. He's good fun to have around. They look fab, I love theSe on boys. Thanks Nicole. Funny we were both sewing coloured denim jeans at the same time. Liddy's are superb! Wow - these are totally pro! That topstitching - incredible. I love the green you chose and the linen, I think, would be simply lovely as well! I think if they were linen I'd want a pair for myself! Oh, and in that dream, I'd have three sewing machines, with each one threaded differently - that's the only downside of doing all that topstitching. Oh those look super awesome. 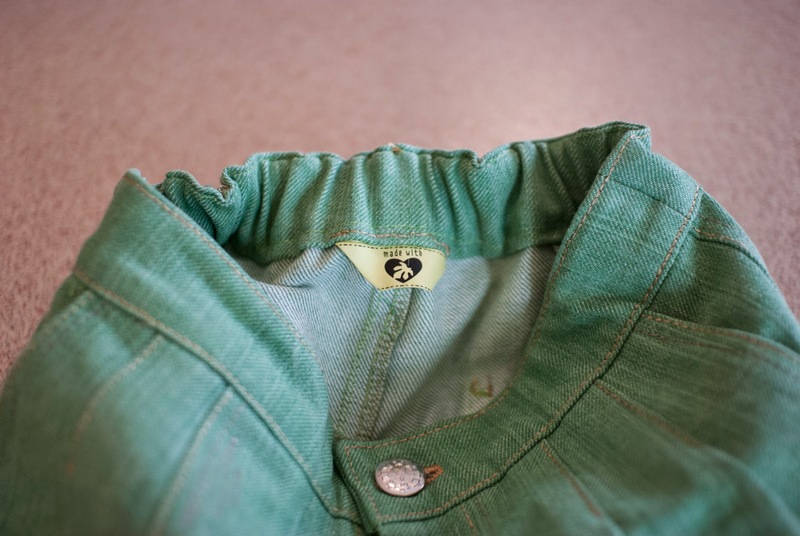 Great fit and the topstitching is freakin' superb. 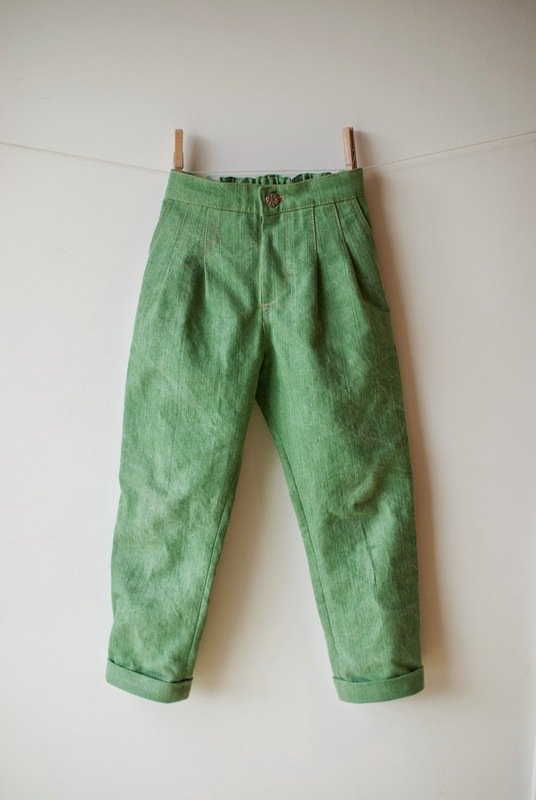 Green pants are just the best, aren't they? So fun but an oddly nice basic. 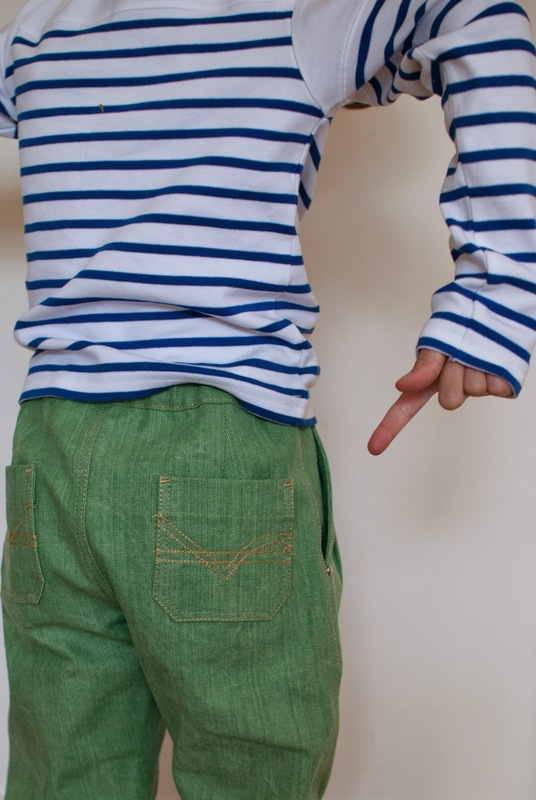 The topstitching on the pockets is great! Thanks Rachel. 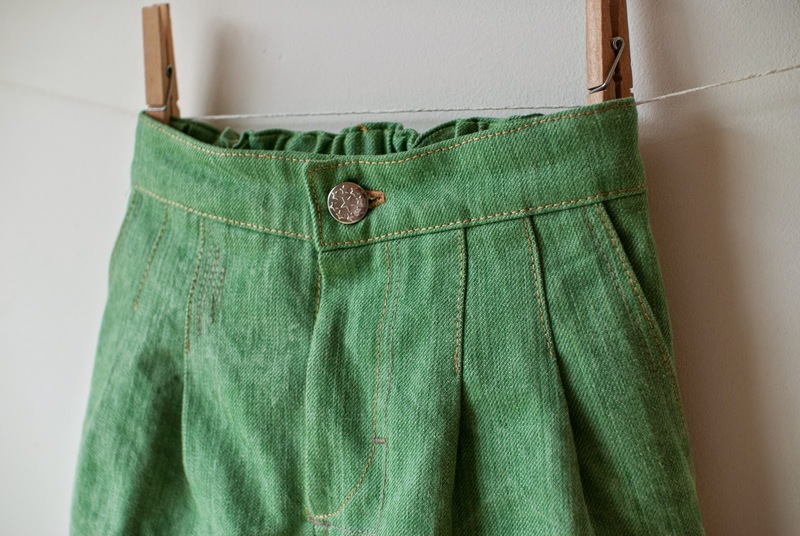 I did start myself a Pinterest board for back pockets. I'll have to keep adding ideas to it as it's endlessly fun to decorate pants pockets! These are freakin' awesome. I love that cut, and the green is just great! And with that top ... well, let's just say I wish I was half that stylin! Thanks. This was styled by him and luck. 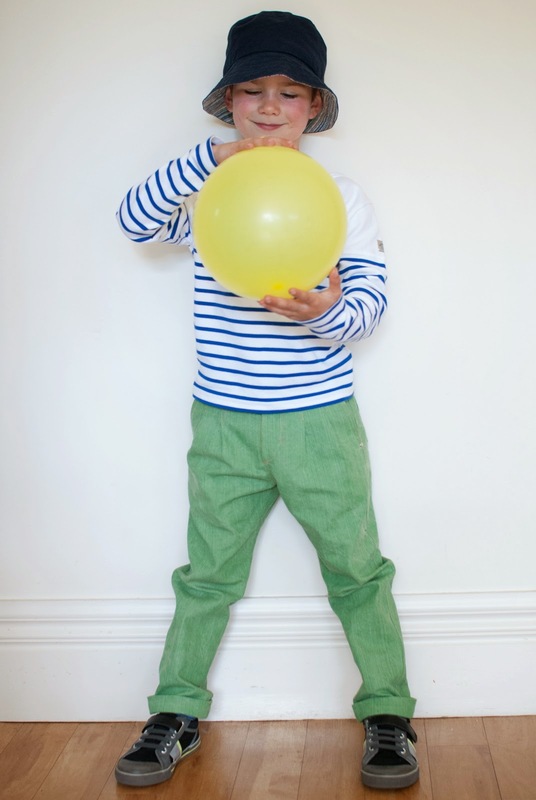 He chose the outfit and was playing with the balloon. All I had to do was grab the camera! Such COOL pants, Shelly. I love them. 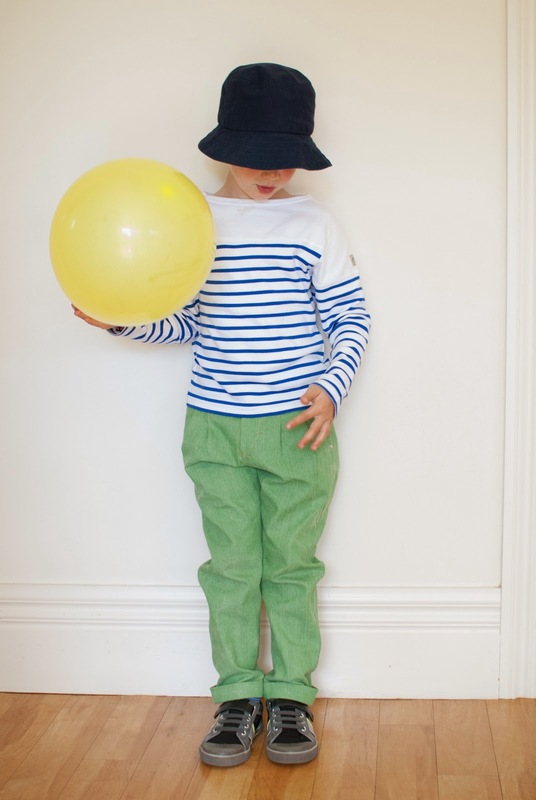 And now that I am looking out for boy's clothes this might be a pattern to get and save. I have a question: how much instructions to Figgy's patterns come with? I am so used to oliver+S patterns that I feel a bit nervous without good instructions. Any thoughts on this? The pattern instructions are generally very good but the zip fly instructions are too vague about the placement of the zipper (where an Oliver + S pattern would have notches and exact placement instructions there are none! ), and it's easy to end up with a completely exposed zip. Use this pattern but someone else's tutorial/instructions for a zip fly!